Splitting logs has come a long way in the last 100 years. Just think, it all started with an ax. These days, we have electric-powered hydraulic splitters, gas-powered splitters, and even kinetic gas log splitters. Kinetic log splitters offer better efficiency and speed, helping users to be more productive and less exhausted, while also eliminating any need for hydraulics. 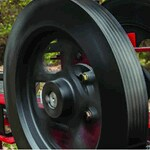 One log splitter in particular, the Split Second kinetic log splitter by Agri-Fab, offers a lot of innovative features. Featuring two 90 lb. flywheels that spin at 365 rpms, the Split Second log splitter produces and stores kinetic energy that equals the strength of a 34-ton hydraulic splitter, but up to 5 times faster with an average cycle time of 3 seconds. It's ideal for splitting twisted, tough, gnarly wood. The Split Second log splitter has been tested using hard beech, elm, sycamore, locust, and stringy black birch, just to name a few. This kinetic log splitter is designed to tackle the toughest of logs, and doesn't get tired either. The kinetic energy is always there in the flywheels when you need it. 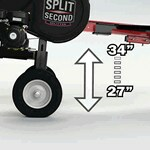 The Split Second kinetic log splitter is the first splitter on the market to be adjustable to the user's height. With its ability to adjust from 27" to 34" in height, the Split Second splitter reduces lower back strain that's usually experienced with repeated bending to operate. Adjustments are made at the rear wheels and the caster jack in equal amounts to provide a level surface for splitting. 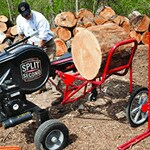 Split Second log splitters come equipped with a 33-inch work table to prevent split wood from falling to the ground. After your log is split, the pieces stay at your level, eliminating the need to repeatedly bend and lift pieces of wood. 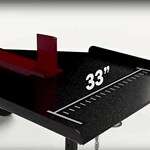 And because the tow hitch is retractable, you can slide the pieces directly from the work table to the bed of your truck or into a cart. With this add-on accessory, you don't have to worry about lifting large logs onto the log splitter. You roll your log onto the lift, then operate a lever on the opposite side to load the log onto the work table. The lift allows you to load up to 180 lbs. of wood at once with minimal effort. And after initial assembly, it can easily be removed as needed. As if things can't get much easier, there's now a Split Second log dolly. This dolly allows you to transport up to 200 lbs. of large uncut logs with ease. To get your logs to the lift, just roll them onto the log dolly, then wheel away. It has 19-inch semi-pneumatic wheels, which make for easier transportation over uneven terrain and even steps. 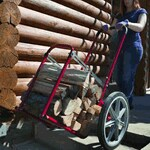 The dolly can also be easily converted to a firewood carrier when you're finished. So, from start to finish, the Split Second log dolly is with you all the way. Split Second Log Splitting With Kinetic Energy.. Our Power Equipment Direct how-to library can help you learn about Understanding the Janka Scale, Proposition 65 Product Labeling and Sales Tax Information.